After I wrote the title I'm thinking, "that's not a bad blog name". 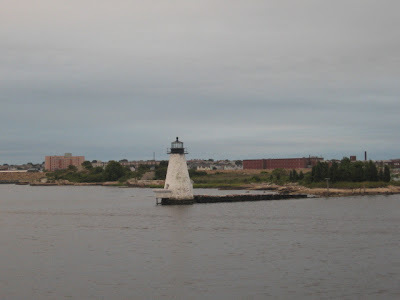 The Newport Yacht Club was sailing from Nantucket and was scheduled to enter New Bedford harbor between the hours of two and four pm. Sue just happened to catch a radio announcement saying "because of high winds the boats would arrive just after noon". 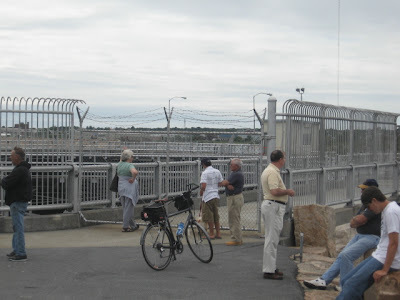 A two mile ride to the ideal spot got us there just as the boats were passing through the hurricane barrier. 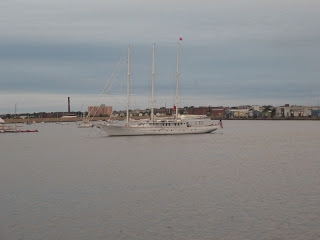 We were expecting, unrealistically, boats the size of the "tall ships" that often call on the port. 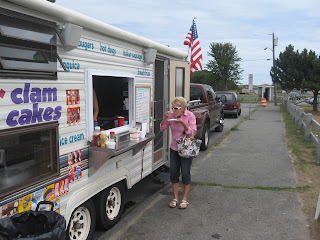 We did get a nice ride and split a dozen clam cakes from the "Clam Cake" man. Not very healthy, but very very tasty. Lots of people who did not catch the news report began to arrive around two. Many were very disappointed at missing the parade of ships. Just as disappointed as those of us who saw the parade. Most were very small and able to be sailed by a single person easily. The exception was the Alabama that is widely regarded as the ultimate example of yankee craftsmanship and traditional wooden shipbuilding. 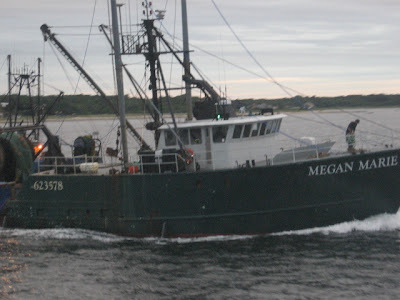 Originally used as a moored bar pilot vessel. Gathering for the parade of ships. 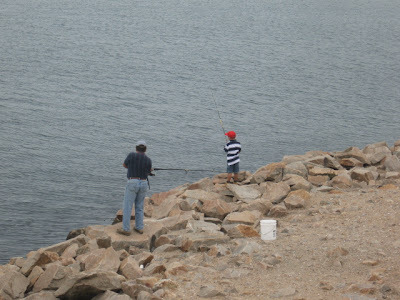 May as well do some fishin'. 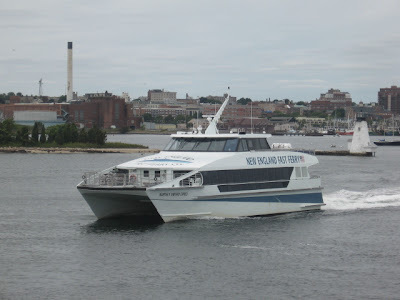 The Steamship Authority was promoting a new high speed ferry route. 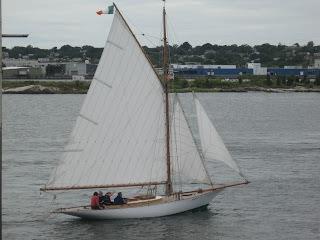 New Bedford to Woods Hole. There is no charge all week for the passage. One round trip at 8PM and one at 7PM. 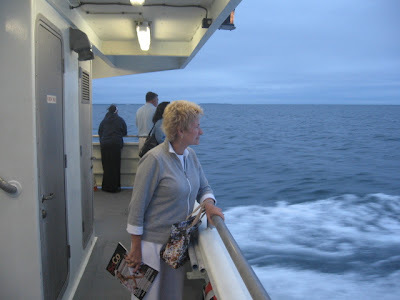 Sue and I took the evening trip and except for the overcast sky, it would have been a wonderful sunset cruise. But it was nice none-the-less. 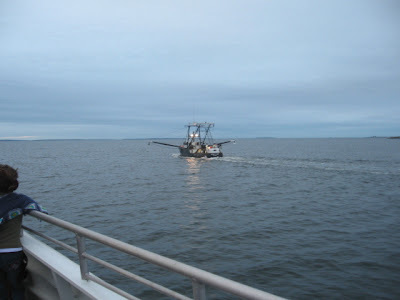 A 35 minute ride to Woods Hole, pick up the returning morning passengers and a 35 minute return trip. The cost will be $7 each way with a $3 charge for bikes. Not bad at all. From there a 30 minute slow ferry ride to Martha's Vinyard for twelve bucks (each way with a bike). The alternative is a $70 high speed ride directly to the "Vinyard". There is some really great riding in and around Woods Hole. 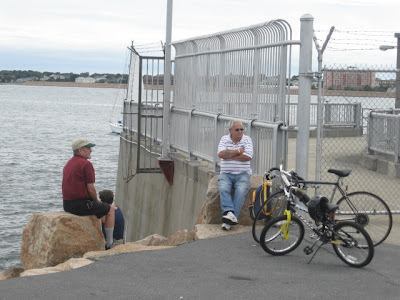 A short trip brings a biker to the Cape Cod Rail Trail. 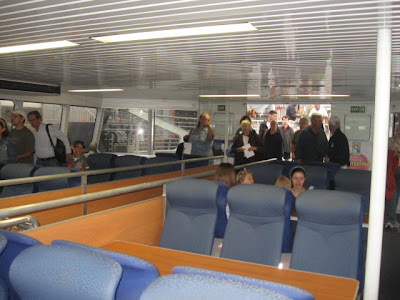 The CCRT is a 45 mile round trip excursion on the newly refurbished MUP. 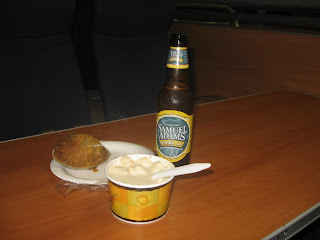 The return trip was cool and very dark so Sue and I settled ourselves below deck to a typical Cape Cod snack of a quohaug, some chowda and a Sam Adams beeyah. It was freakin awwwsum. 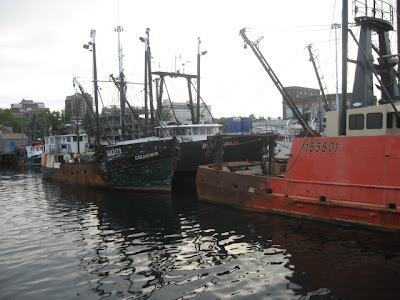 Fishing fleet at pier 2 in New Bedford, Ma. 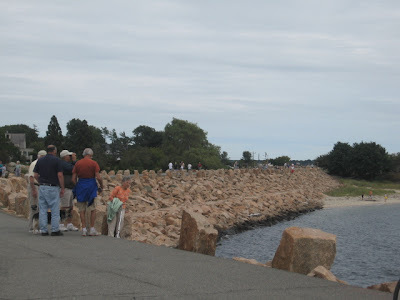 Our family enjoyed the Cape Cod Rail Trail when we were up there a few weeks ago. It was the sole rainy day on our week-long visit to Boston and area and was probably the best day to be out and about in the rain.